The champion among full-size pickup trucks for decades is Ford F-150. 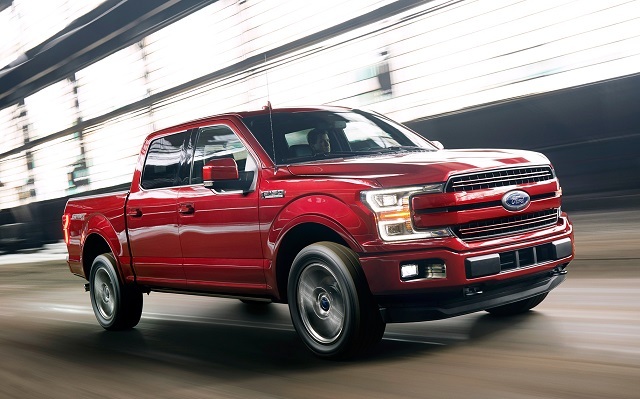 This model isn’t just Ford’s best-selling truck but their best-selling vehicle overall. It offers a variety of trims, from XL and XLT workhorse models, off-road Raptor model to luxury Platinum and Limited models. All of them can be matched with several powertrain options which additionally helps the new owner to find the perfect truck. Aside plenty of trim options this Ford F-150 is constantly changing. Every year Ford’s engineers and designers are implementing something new. This year’s model already received new first-ever diesel powertrain which provides better towing capabilities. They didn’t stop there because new 2019 Ford F-150 will also offer hybrid system under the bonnet. This move will, for sure attract truck lovers with higher environmental awareness. Like before, new 2019 Ford F-150 will be produced on the same platform. It will be offered in 5.5-foot, 6.5-foot, and 8-foot bed configuration. The design will also stay unchanged. The base XL and XLT trims with the V6 engine and a six-speed automatic transmission will be the most affordable with the starting price of $27,400. Even though they are made to be workhorses, they arrive with respectable features. Inside you can find power windows and central lock system, smartphone app integration, SYNC infotainment system, MyKey, and the rearview camera with Dynamic Hitch Assist. 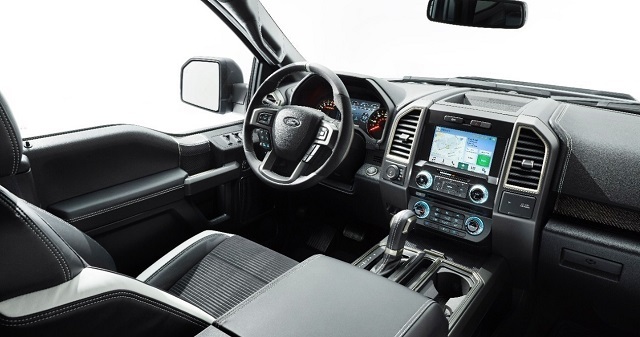 The F-150 Lariat will additionally offer heated, power-adjustable front seats, leather upholstery and satellite radio. The price off-road F-150 Raptor model will be around $50,000 which is not negligible. However, for that price, this truck comes with off-road-related features like off-road racing suspension and a locking rear differential. Also, all-wheel drive matched with a V6 turbocharged engine is standard. The Platinum and Limited trims are made pickups made for hedonists. These models offer all the latest technology and safety features like blind spot monitoring, pre-collision assist with pedestrian detection, rear cross traffic alert and a 360-degree camera, but their price will be close to $60,000. Made to be a workhorse or every-day vehicle each truck has to be pumped up with power and ready to tow when necessary. The new 2019 Ford F-150 will have two familiar EcoBoost engines under the hood. The smaller 2.7-liter V6 comes improved power and helps the truck to tow up to 8,500 pounds. The bigger 3.5-liter EcoBoost V6 is one of the best in class with its 375 horsepower and 470 lb-ft of torque. Towing capacity with this engine under the hood and new 10-speed automatic transmission reaches 13,200 pounds. Since the last year, F-150 has a diesel engine as an option. It is a 3.0-liter Power Stroke turbodiesel engine with 250 hp and 440 pound-feet of torque. Thanks to the high torque, towing capacity will stay respectable but fuel consumption will be significantly improved. Unlike its predecessor, 2019 Ford F-150 will have one more powertrain which is not a huge fuel consumer but it’s also eco-friendly. From the next year, this pickup truck will offer a hybrid system as an option. For now, it is probably going to be a 4-cylinder turbocharged engine combined with two electro-motors but in the near future, we can even expect their EcoBoost V6 matched with some hybrid system. With this move, Ford could easily answer every demand in the light-duty pickup truck segment. The new 2019 Ford F-150 will find tough competition in GM’s Sierra and Silverado 1500 trucks. Likewise, Nissan Titan and Toyota Tundra with their new diesel powertrains are very respectable opponents. However, Ford offers the biggest variety of trims and with the price range from $27,400 to $64,000 it reaches in all classes of the society. Also, the different powertrains can make this truck a workhorse, but also an everyday vehicle or an off-road wizard. The new hybrid system shows that Ford think about everybody. This move will attract people with the higher environmental awareness who also appreciate raw power. FOR ONCE IN MY LIFE!! A TRUE BLESSING FOR ME AND MY BOYS.